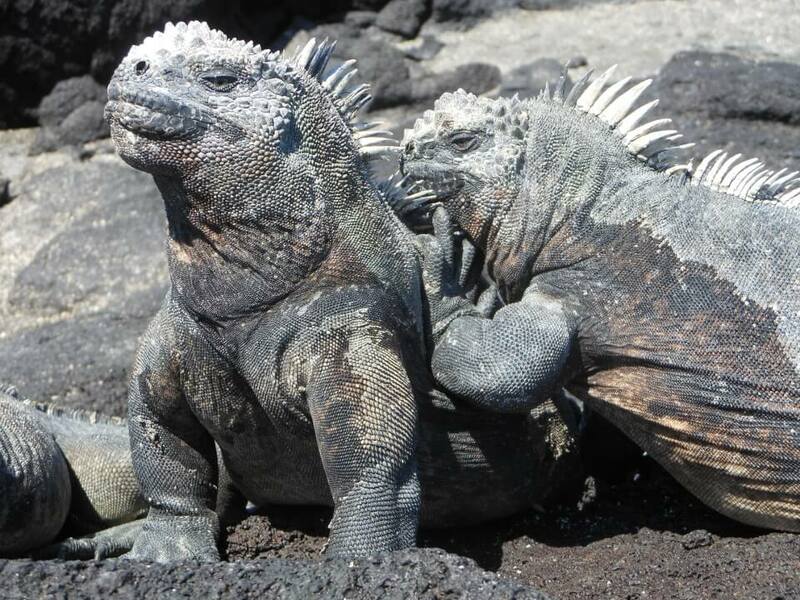 Marine Iguana Breeding Season in Galapagos: Ready to Rumble! Marine Iguana Breeding Season: Ready to Rumble! The right colour, at the right time, at the right place. That’s all that really matters when it comes to marine iguana mating season in Galapagos. Marine Iguanas, a member of our BIG15 group of iconic species, displays an extraordinary array of visual and behavioural patterns during hot season! In this blog, we invite you to find out how they do it and why they do it! 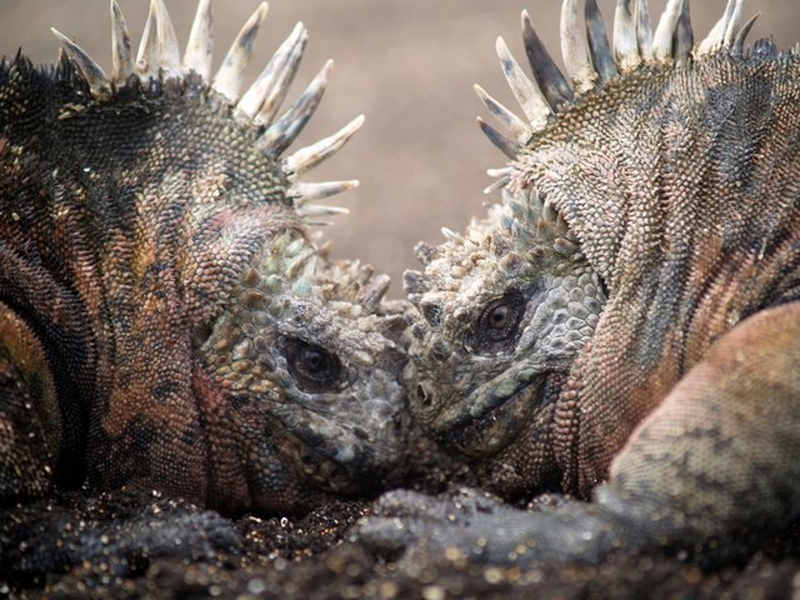 When is Marine Iguana Mating Season? With the arrival of the hot season (Dec-May) comes many things in Galapagos, one of which is marine iguana breeding season. At first glance, one might consider it rather peculiar for marine iguanas to begin their mating season during this relatively odd time of the year. Why inconvenient? Principally because water temperatures rise, meaning that the presence of nutritious algae in the ocean – one of the marine iguanas’ largest sources of food – drops substantially. In a nutshell, this means that marina iguana breeding season begins right when food supplies are at their all-time lowest. But this is, in fact, part of their instinctual strategy, so to speak. Marine iguanas, however, are pretty much prepared for this harsh period. The fact is that they stocked up tons back when Galapagos waters were pretty much overflowing with algae during the dry season (Jun-Nov). This means that if you come upon them at this point in the year, marina iguanas look comically plump. But this has a lot to do with what we’ll talk about in the following section regarding behaviour. Marine iguanas and bears are similar in the sense that they stock up on food during specific periods. Bears in order to sleep through the winter, marine iguanas in order to mate through the beginning of the hot season. There’s an even more fundamental reason for why marine iguana breeding season begins during the hot season. The weather is optimal and the environment is ideal for laying eggs. Humidity and temperature are crucial factors in the success of their eggs. Increased levels of these two variables is exactly what the hot season entails. As a result, marine iguana mating season begins now, leading to some rather fascinating physiological changes in the process. Our Galapagos Explorer Extraordinaire, Pancho Dousdebes, getting nice and low to capture flattering shots of the marine iguanas. The most notable of these physiological adaptations is the mesmerizing shade of teal that appears on the edge of the marine iguanas. Such as their spine, their face and even their legs (Seen on Marine Iguanas on Española Island). This serves as a visual indicator that marine iguanas are ready to mate and also leads to some pretty spectacular behavioural changes, too. All the energy that marine iguanas have saved during the dry season is now put to the test. Males iguanas primarily invest their energy in doing two things: chasing tail and protecting their territory. These instincts manifest themselves in physical behaviours such as head bobbing. Head bobbing serves as a signal to other that they’re ready to mate and that they’re also ready to defend their territory. Ready to Rumble! Two male marine iguanas duking it out over their territory. Females iguanas, on the other hand, invest this saved up energy into finding a suitable place to lay their eggs. A large amount of their energy is spent testing or “probing” different areas as they search for a suitable place to lay their eggs. They check for moisture and make sure there isn’t too much debris in the way of their nesting site. Once they find a perfect nesting spot, they dig a hole about 1-foot/0.3-meters deep to lay their eggs inside and then cover it. Worth noting is that the act of laying eggs entails a considerable consumption of energy, too. Females will also defend claim their nesting territory, if necessary. The eggs that are laid are oval-shaped with a leathery, soft feel to them – squishy almost. This is a natural adaptation that helps foster embryo development. The shell creates a permeable layer through which water and moisture are able to get in and help with the development of the embryo. The mating process between marine iguanas is rather violent, in a certain sense, it has to be. It is an incredibly painful process of insemination for the female. And this makes them understandably “reluctant” to partake in the act of mating. Consequently, the male must often grasp and pin the female down in order to keep her from squirming away from said act (and pain). Once this brief ordeal is over, the female will lay her eggs roughly five weeks later. She will lay anywhere between 6-8 eggs which will eventually lead to marine iguanas hatching. Hatching typically occurs around April/May of the following year. Conveniently coinciding with the transition into the dry season, right as upwellings are bringing back nutritious algae to help feed the next generation of marine iguanas.